Gower Street takes its name from Lady Gertrude Leveson-Gower, who in 1737 married the Bloomsbury landowner John Russell, 4th Duke of Bedford. Laid out from the 1780s onwards under Lady Gertrude’s super­vision, Gower Street retains one of London’s longest sets of unbroken Georgian terraces. Critics initially decried the street’s plainness and John Ruskin is said to have called it “the nec plus ultra of ugliness in British archi­tecture.” The Bedford estate later added some stuccoed entrances to relieve the brown-bricked gloom. In 1808, on a circular track built somewhere between present-day Gower Place and the Chadwick Building, the engineer Richard Trevithick demon­strated ‘Catch Me Who Can’ – the first steam locomotive to pull a carriage carrying fare-paying passengers. However, it proved too heavy for the brittle track and Trevithick closed his exhib­ition after a few weeks, following a derailment. During Gower Street’s devel­opment, a square was proposed near the northern end but the land was taken instead for what became University College London (UCL). The university was founded to provide an altern­ative to the Anglican-dominated colleges of Oxford and Cambridge and was nicknamed ‘the godless insti­tution of Gower Street’. The Wilkins Building opened in 1828 and the university has since progress­ively expanded to consume most of the east side of the street and the land behind it. University College hospital opened on the west side of Gower Street in 1833, bringing surgeons and doctors to the resid­ences nearby. The hospital’s early medical students invented ‘Gower Street dialect’, which was based mainly on what are now called spoon­erisms, such as ‘poking a smipe’ for ‘smoking a pipe’ and a ‘stint of pout’ for a ‘pint of stout’. By the middle of the 19th century many of the street’s capacious properties had been illegally converted into private boarding houses. The Bedford estate struggled (mostly in vain) to close down these estab­lish­ments in a bid to maintain the locality’s reputation as a place of ‘genteel resid­ences’. Nowadays calling themselves ‘boutique hotels’, some Gower Street premises still provide accom­mod­ation for overnight guests. Gower Street was one of the original stations on the London Underground when the Metropolitan Railway opened in 1863. Forty-six years later the station was renamed Euston Square. 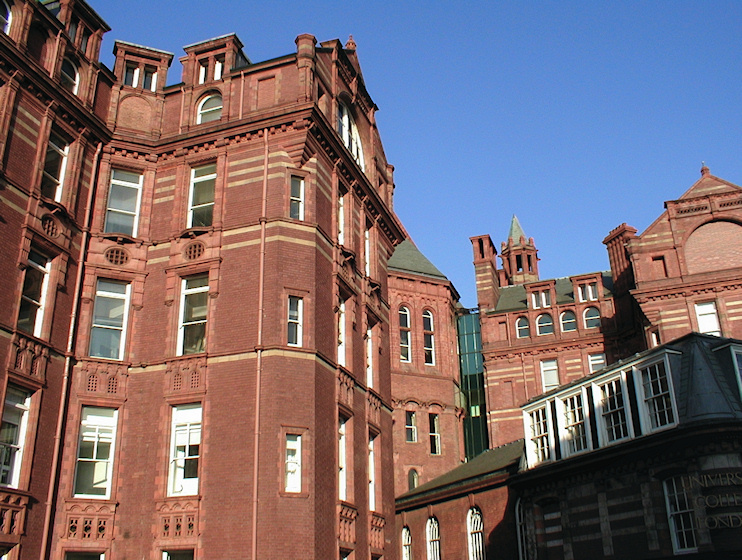 University College hospital was rebuilt in flamboy­antly baroque style by Sir Alfred Waterhouse and his son Paul over the ten years to 1906. Now known as the Cruciform, and shown in the photo­graph above, this building became part of UCL’s teaching facil­ities in 1996. The hospital moved into a spectacular pair of new buildings on Euston Road in 2005. 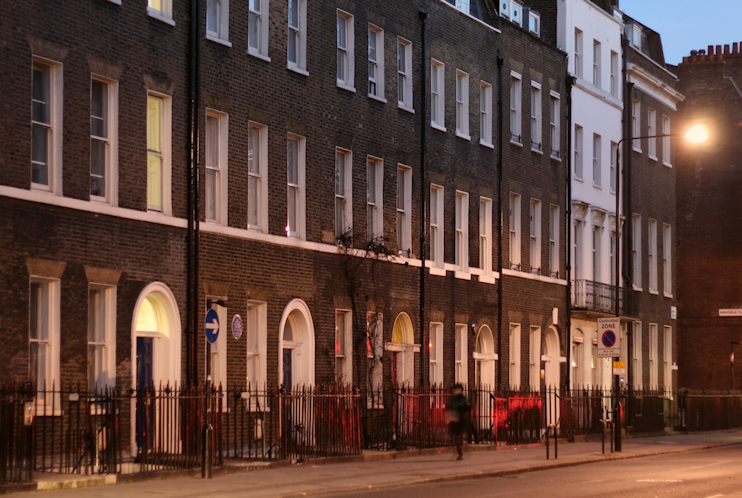 Gower Street’s edifying museums make it a miniature South Kensington. UCL’s Petrie Museum (accessed from Malet Place) and Grant Museum of Zoology house Egyptian archae­ology and natural history collec­tions respect­ively, the latter featuring plenty of skeletons and mounted animals, including a marsupial wolf. After drawing up a list of the pros and cons of marriage, Charles Darwin proposed to his first cousin Emma Wedgwood, and married her in 1839. The newlyweds moved into a house on Gower Street, but three years later Charles’s increasingly poor health prompted them to relocate to the country village of Downe. The Pre-Raphaelite Brotherhood was founded in John Millais’s parents’ house on Gower Street in 1848.